Even though the synthesis report is more alarming than its predecessors, some researchers believe that it still understates the trajectory of global warming and its impact. The I.P.C.C.’s scientific process, which takes five years of study and writing from start to finish, cannot take into account the very latest data on climate change or economic trends, which show larger than predicted development and energy use in China. 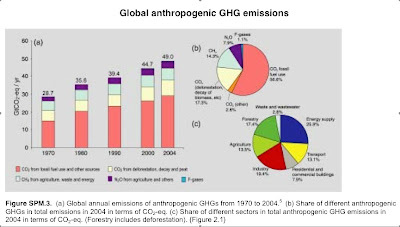 In 2006, 8.4 gigatons of carbon were put into the atmosphere from fossil fuels, according to a study in the proceedings of the National Academy of Science, which was co-written by Dr. Klepper. That is almost identical to the panel’s worst case prediction for that year. Likewise, a recent International Energy Agency report looking at the unexpectedly rapid emissions growth in China and India estimated that if current policies were not changed the world would warm six degrees by 2030, a disastrous increase far higher than the panel’s estimates of one to four degrees by the end of the century. “The highest point in Delaware is a bridge." The Senator may be guilty of a slight exaggeration. If he means the Delaware Memorial Bridge, the top of the towers is 440 feet above the water, which is eight feet lower than the state's highest point, near Centerville. Wind power could use some of Carper's hot air in the form of a federal bill that allots money in subsidy of alternative energy and off-shore wind in particular. What about our federal delegation getting their act together and giving Delaware something for its future: "The Honorable Carper/Castle Wind Farm is dedicated to you, the children of Delaware." Correction: I don't know how far Centerville is deemed to stretch, but the highest point in Delaware is behind Concord High School. Ebright Road. I would call that Talleyville. Which state's highest point is the second lowest of all the states?